We're in the Kindle Store! You can now subscribe to the NOTE: blog via the Kindle Store. If you have a Kindle device (it's not available to Kindle apps) and you're in the UK or USA, you can subscribe from the addresses shown at the bottom of this post. There's a small monthly price (£0.99 in the UK, $0.99 in USA) shared between Amazon and me. Of course, you can get every blog post for free from the web site, or from our RSS feed, or from our email subscriptions, so why would you pay? In a word: convenience. Sure, you can subscribe to our RSS feed at no charge, but then you have to remember to visit your feed reader or RSS folders on Outlook to read the incoming posts. If you receive our feeds via email, it's just one more email in a crowded in-box. Many people subscribe to multiple blogs, which multiples the problem. But, if you get your blog posts delivered to your Kindle device then you can read them in their leisure time, away from your computer and email. This is especially attractive to people who travel or commute on public transportation. If you're out and about and carry your Kindle, no matter what time of day your favourite blog is updated, you can open your Kindle and read the latest entry. 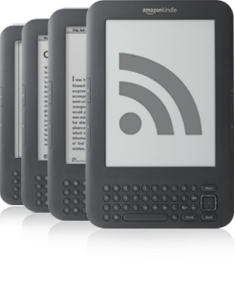 Kindle version blogs include the full text of each blog post plus its images. Remember, all Kindle blogs come with a 14-day free trial. Try it to see how you like it! And, write a comment and let us know what you think. NOTE: Are You Game for Big Data Overload?